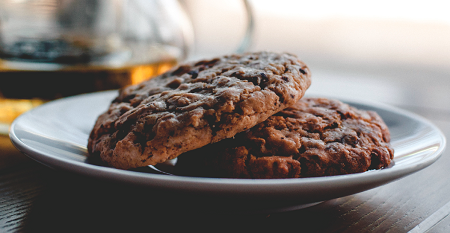 This chocolate oatmeal cookie recipe is delicious but I recommend using a quality dark chocolate to make them as tasty as possible. I recommend Divine because they are one of the few guaranteed ethical chocolate brands. They buy from a co-operative that also owns 45% of the company. This means that the cacao – usually a poverty crop – is suddenly very profitable and these farmers see a future in cacao. Chocolate can only grow within 20 degrees of the equator and it takes a tree five years to become commercially viable for cocoa pod production. In Ghana the Kuapa Kokoo makes sure that big or small, all farmers get a fair price, using fair scales, weighed by an elected member of the co-operative, and they get paid promptly. In the Ivory Coast and outside this co-operative, big companies can leave farmers waiting months for payment and sometimes do not ensure farmers are paid fairly. These cookies do not last long once baked because they are so delicious! Preheat the oven to 160C or 150C if you have a fan oven like mine. Line two baking sheets with greaseproof paper. In a large heat proof bowl (because we’ll be pouring hot liquid into it) blend the sugar, flour, vanilla, oats, and the chopped 70% chocolate. In a small pan on the stove, heat the butter, golden syrup and water until the butter has melted completely but do not bring to the boil. Take the pan off the heat and add the baking soda which if it is active will cause the mix to fizz up. This is fine but if it fails to fizz, your baking soda may be too old and need replacing. Pour the hot liquid over the dry ingredients and mix to melt the chocolate and combine. Not all of the chocolate will melt and this is perfectly OK as we want some chocolate chunks in there. Using a tablespoon, scoop out even amounts of the cookie dough and form them into balls. I usually weigh the balls and use around 45g. Place the cookie balls on the baking trays and gently press down gently to spread the balls slightly but do not roll flat. Since these will spread, make sure there is at least two inches between each flattened ball. Bake the cookies for around 10 minutes until the cookies look to be set (they are brown – they aren’t going to turn brown like my favourite chocolate chip cookie recipe) and the cookies are just beginning to crisp. This recipe can be frozen. I usually create the balls and weigh them so they are all 45g and then freeze them in plastic wrap and in Tupperware to prevent freezer burn and to keep them separate so I can easily remove two to bake at a time.